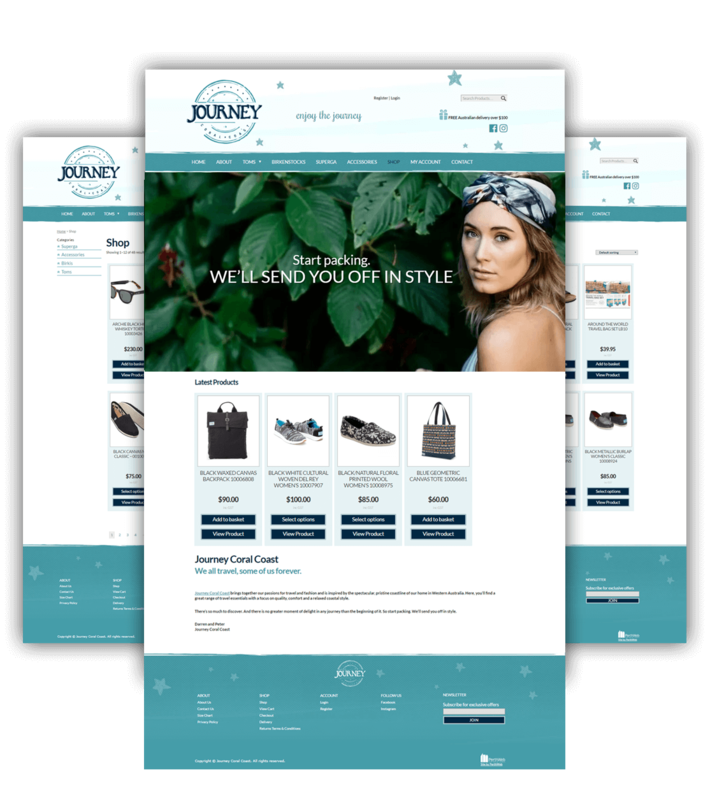 Journey Coral Coast came to us to develop a website to support their existing pop-up stores & to create a logo that matched their passion for fashion and travel. Their online retail store would sell high class shoes and accessories, perfect for travellers embarking on luxury holidays. Journey Coral Coast were determined to make sure their website and logo conveyed their passion for travel, fashion & style. The website needed to give a coastal, ocean vibe feel with a strong emphasis of embarking on your journey. The logo needed to be clean, elegant and easily recognisable. The website will primarily be used as an online retail store to sell the range of carefully selected luxury holiday products. The products are all hand picked and harmonise with Journey Coral Coast’s adoration for all things fashion & travel. These products need to be easily added to the cart and purchased, while making sure PayPal was used as the payment gateway. We started by creating a clean, elegant logo that accentuated the word Journey, giving it a stylish & fashion vibe. From here we used a range of light & dark blues and crafted a design for the website that fit with the ocean feel. Large, crisp, travel related images helped push the look and feel Journey Coral Coast wanted to achieve. Using the popular Woocommerce shopping cart allowed PerthWeb to display Journey’s exciting range of products cleanly. This allowed them to be easily navigated to, added to their cart and purchased almost instantaneously. Customers are then routed through the secure PayPal payment gateway to complete their transaction and await there stylish new travel accessories! Check out Journey Coral Coast.